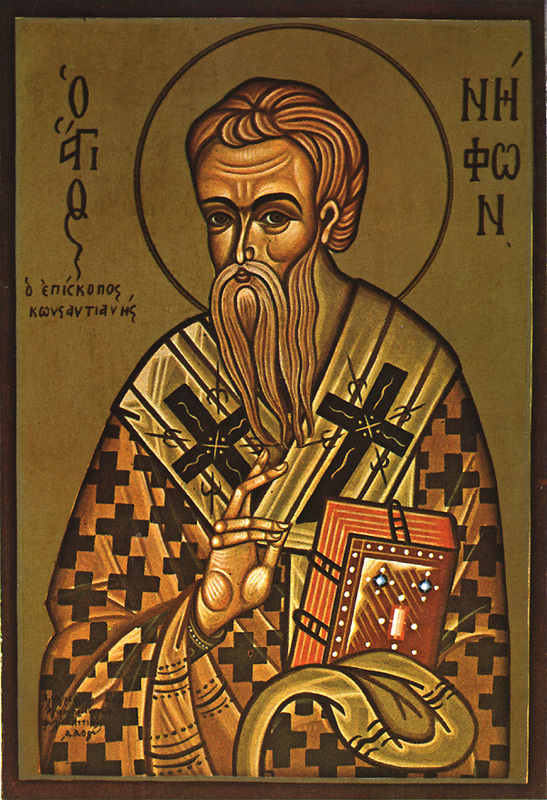 Saint Nephon was born in Paphlagonia and was educated at Constantinople in the court of the commander Sabbatios. In childhood he was gentle and good, and he often attended church services, but in his youth he began to lead a prodigal and sinful life. He sometimes came to his senses, and he was horrified by the extent of his fall; but believing that he was lost and could not receive forgiveness, he despairingly resumed his impious life. He once met a friend who gazed into his face for a long time with astonishment. When Nephon asked why he was staring, the friend replied, “I have never seen your face like this before. It is black, like that of an Ethiopian.” These words showed to Nephon his fallen state, and he began to cry out to the Mother of God, begging Her intercession. After an intense and long prayer he saw that the face of the Mother of God on the holy icon was radiantly bright with a smile. From that time Nephon prayed incessantly to the Queen of Heaven. If he fell into sin, the face of the Mother of God turned away from him, but after tears and prayers, she mercifully turned toward him again. Finally, Nephon completely turned his life around and began to spend his time in prayer and repentance. After an illness, from which he received healing from the Mother of God, he received the Holy Mysteries, and then accepted monastic tonsure and intensified his efforts, exhausting his body in the struggle against the passions. This struggle lasted for many years, and devils often attacked Saint Nephon, but with the help of God he overcame them. For four years he endured a difficult struggle with a demon, who constantly whispered to him: "There is no God! There is no God!" But, when the Lord Jesus Himself appeared to him alive on an icon, Nephon received great power over evil spirits and was freed from these grievous temptations. He was such a great seer that he saw angels and demons around men just as clearly as he saw men themselves, and he knew the thoughts of men. He received from God the gift to discern evil spirits and defeat them, and also to see the departure of the soul after death. Often he spoke with angels and disputed with demons. He built a church to the Most Holy Theotokos in Constantinople, gathered monks together, and saved many souls. Already advanced in age, and arriving at Alexandria, he was pointed out to Patriarch Alexander in a vision as one worthy to assume the office of bishop. They made him bishop of the city of Constantia on the island of Cyprus. However, he did not remain there for long. 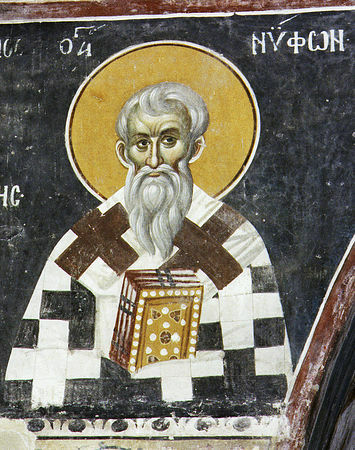 Saint Nephon knew the time of his death three days beforehand. 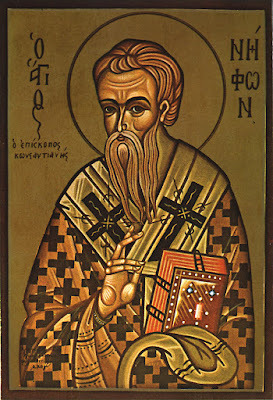 Saint Athanasius the Great visited him before his blessed repose while he was still a deacon. On his deathbed the Saint was granted to see angels and the All-Pure Mother of God. After his death he was seen by Athanasius, his face shining as the sun. It should be noted that Saint Nephon is not mentioned in any of the ancient Synaxaria and Menaia, but his name and life is mentioned in ancient manuscripts at the Athonite Monasteries of Great Lavra and Vatopaidi. In the former it says he reposed on December 23rd, though it says he was the Bishop of Almyropolis. 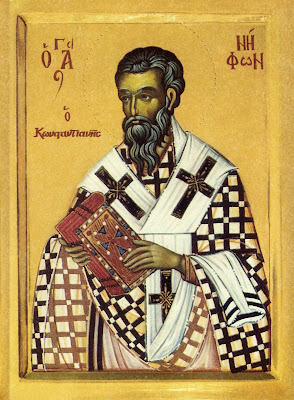 A modern translation of his life from the ancient manuscripts was published in 1993 under the title An Ascetic Bishop. Thou wast chosen by God to be a shepherd and herald of His Church, and to teach repentance to the fallen. By thy prayers thou didst reveal the demons' deceits, and thy countenance shone like Moses'. O Father Nephon, pray to Christ our God for those who honour thee. Thou didst subdue the flesh by fear of God, and didst soar to the heights of knowledge. Thou didst attain to thy desire, O blessed Nephon. Intercede to Christ our God for all who honour thee.